Walk-in rate is $20 per person cash (exact change) or check. See below for more event information. This tour is a specially organized event that will be held by AIA Honolulu on this date only. Docent-guided tours will explore a general history of the historic Punahou campus, sharing stories and features of several buildings. Many of the docents have been involved in the planning and design of the campus, adding to their knowledge of the institution. Meanwhile, each tour focuses on Punahou’s sustainable initiatives and how the campus communities strive for the highest level of green design. 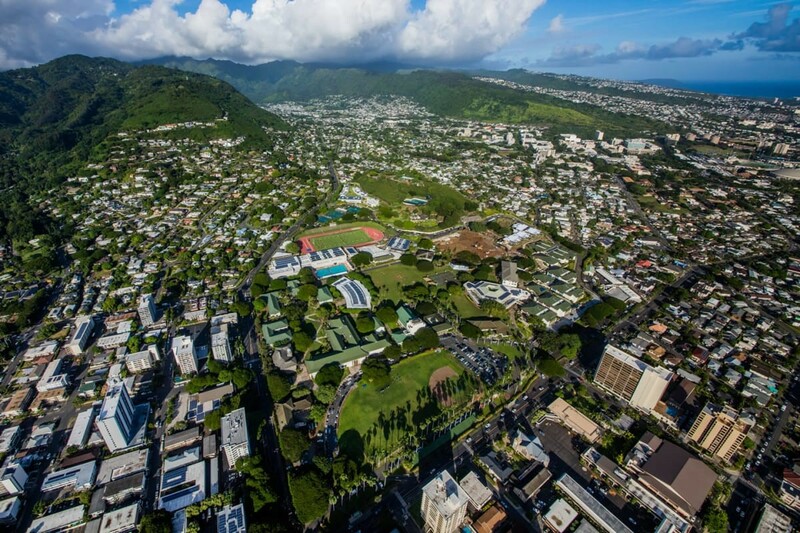 Over the course of 2 hours (about 1.5 miles), walkers will learn about architecturally significant historic and recent buildings including descriptions of Punahou’s sustainable initiatives and how the campus communities strive for the highest level of green design. Condition of Route Disclaimer: The Punahou campus is built into a hillside with multiple level changes throughout the grounds. The walking route has been selected to provide the maximum level of wheelchair accessibility the campus can provide. Detours to ramps, elevators, and lifts are provided along the route, however, an expansive portion of all routes are steep, rough and uneven. Participants are to use their discretion when signing up. Comfortable shoes, sunscreen and hats are highly recommended; walkers are encouraged to bring water and snacks to keep their energy up! Meeting Point - Staggered Tours: Start and end point of this tour are not in the same location. Our registration table will be in front of the Community Room a the Omidyar K-1 Neighborhood. Please check in 15 minutes prior to your scheduled tour to find your tour guide and use the restroom. Restrooms are located inside the Gathering Hall. End of Tour Location: Cooke Hall. Cost: $15/person supports AIA expenses. Advance payment and reservation required. AIA/CES: Qualifies for 1.5 AIA/CES LU (HSW). AIA Honolulu is the registered provider. Advanced online reservation is required. We will start groups of 10-12 people every 10 minutes. On the registration form please indicate your preferred start time and we will contact you by email/phone a few days before the event with your exact start time. Limited parking is available adjacent to the Dillingham Tennis Courts along Simon Way and Piper’s Pali. Overflow parking will be available in front of Case Middle School off Wilder Ave. and adjacent to Chamberlain Field.